For exceptional bathroom design means, interior designers prefer a coherent, coordinated look. After the successful launches of Eurocube & Euphoria Cube, GROHE finally completes the “Cube bathroom” for fans of sleek, cubist design. From basin and bath mixers to showers, thermostats and accessories, the GROHE Cube ranges offer cutting-edge geometric styling ideal for the contemporary bathroom. 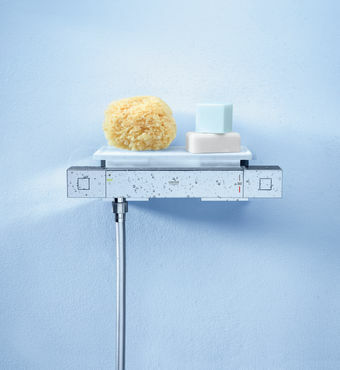 Safety, technology and style meet in all of GROHE’s thermostats –also in the the new Grohtherm Cube thermostatic range,. The Grotherm Cube is fitted with the precision-engineered TurboStat® cartridge for the safest, most reliable shower and bath experience around. 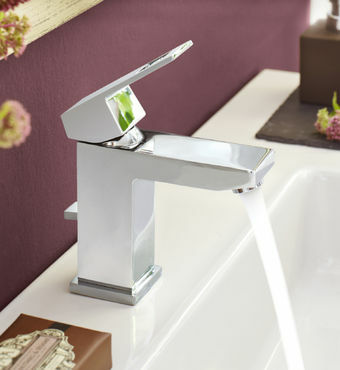 Add to that GROHE’S eco-options and a Waterfall bath spout feature and Grotherm Cube is the perfect last detail. 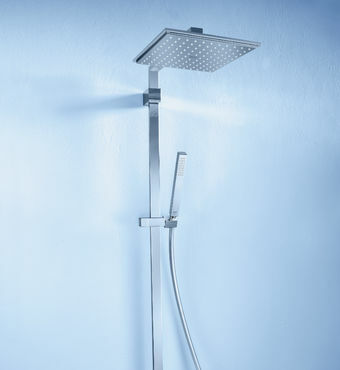 Slender, simple and clean-lined, GROHE’s acclaimed Cube design comes to their ground-breaking Euphoria showers. The luxurious Euphoria shower system features both a Grohtherm Cube thermostat, a cube hand shower and a stunning XL fixed-head rain shower in Cube’s distinctive, architectural style. True Square Design. Eurocube one-hand mixers. Clean lines, crisp angles and a unique handle detail make Eurocube one-hand bath and basin mixers the sophisticated choice for modern bathrooms. Whether it’s a basic pillar tap or a four-hole bath solution Eurocube has an option for you, and all including GROHE’s SilkMove® and StarLight® technology as standard. 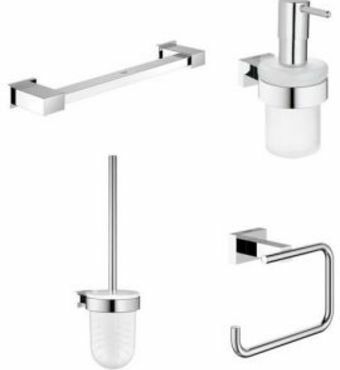 Get cubist bathroom design right, down to the very last detail with the Essentials Cube range of accessories. Designed to work with GROHE’s distinctive Cube mixers, showers and thermostats, Essentials Cube accessories offer the same dynamic, cubist look for a complete bathroom scheme. From soap dishes to robe hooks, every detail works together, and all enhanced by GROHE’s StarLight® chrome finish.